Nothing makes me feel more successful and powerful, than a good deal! The feeling that you’re walking out of the store, or excuse me, skipping out of the store because you just out-smarted your wallet. You’ve just made your own day! Well that’s exactly what I felt after a recent trip to Nordstrom Rack where I scored two statement pieces for pennies! …with that said, these two pieces POPPED off of the Nordstrom Rack and were heavy with major luxury and style! 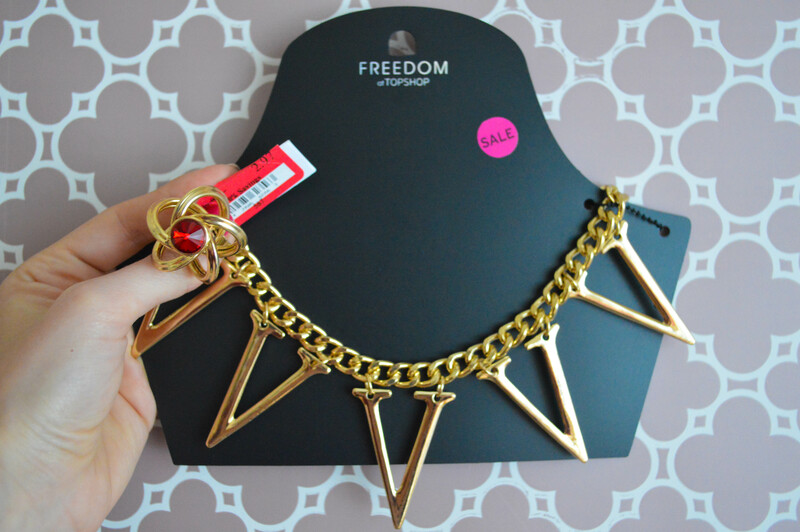 FREEDOM TopShop.com Multi-Initial Necklace for $9.97 … that’s 67% off the original price! And, this no designer label, gold and rhinestone ring for $2.97! SEE GALS! Statement pieces don’t have to cost you BIG BUCKS, obviously! So for all my gal pals who shop on pennies… remember the principles and bring your confidence! Hint hint… time to shake out the piggy bank and stack up on spring time steals! Previous PostMy Vintage Easter Outfit for $14! Next PostColor Mixing? Why NOT!